If you aren’t new to camping, you know the struggle to find a camping pillow that works. You either take your pillow from home, which is bulky and likely to get damp during your trip or make a makeshift pillow out of a pillow case and some spare clothes or a blanket. Not exactly comfortable, either way. The best camping pillows combine durability, portability, and comfort. Ultimately, your decision will depend on your preferences and the kind of camping you’re doing. We’ve done the research for you and consider these 7 pillows among the best performing camping pillows for backpacking in 2019 for both novice and seasoned campers. What You’ll Like It: If you have problems with this pillow, the company is known for great customer service. Trekology’s ultralight ALUFT camping pillow inflates in as little as three to five breaths and deflates in seconds using the Quick Deflate feature. Once inflated, you can adjust the firmness to your preference. The pillow is made with 20% highly durable elastic TPU fabric and 80% Polyester, available in multiple colors. The bottom has a slip resistant design, so you don’t wake up with your head on the ground. The ALUFT pillow is compact, yet comfortable and ergonomic. When fully inflated, this ergonomic pillow is 16 x 12 x 4 inches. It compacts down to a mere 5 x 2 inches (smaller than a soda can) and weighs only 2.75 oz! Pros: Can be used by all sleepers for neck or lumbar support; comes with a storage bag and 100% satisfaction guarantee. Cons: Makes a little noise when you move; as with inflatables – there is a risk of air leaks. What You’ll Like It: A luxury camping pillow that’s naturally thermo regulating, hypoallergenic, and dust-mite resistant. Coop Home Goods’ camping pillow has a breathable stay cool cover made from 40% bamboo derived viscose rayon and 60% Polyester. Customers love that it’s machine washable and handcrafted in the USA. This pillow uses only CertiPUR-US Certified memory foam, which can be added or removed for customized support. When compacted the pillow measures 10 x 6 inches and expands to 19 x 14 inches for sleep. Coop Home Goods’ travel pillow weighs 32 oz and comes with a stuff sack for easy portability. For optimal comfort and durability, the company uses the same materials as their luxury bed pillows. Pros: 5-year warranty, good for all sleep positions. Cons: Bulkier and heavier than other camping pillows. What You’ll Like It: A camping pillow with medical grade memory foam and a super soft velour cover. Cozy Hut Camping Memory Foam Pillow uses a curved, ergonomic design for improved neck support. Great for all sleeping positions and as a lumbar pillow, it measures 16.5 x 7.8 inches. This camping pillow balances support and comfort nicely. This pillow compacts in seconds to 8.3 x 5.5 inches in its storage bag and weighs just 16 oz, making it easily portable. Compared to other memory foam travel pillows, this one is lighter and more compact, offering the best of both worlds. Other perks of Cozy Hut’s camping pillow include the fact that It’s hypoallergenic, anti-bacterial, and dust mite-resistant. The inner cover is durable, yet breathable and moisture wicking to keep your head cool at night in any weather. Pros: Outer cover is machine washable. Cons: Too thick/firm for some sleepers. Why You’ll Like It: This pillow’s synthetic fill increases comfort and wicks away perspiration. Sea to Summit’s Aeros Pillow Premium inflates in just a couple breaths. This pillow is made using a combination of durable TPU fabric and brushed Polyester for a soft but durable finish. The shape of this pillow was designed to contour your head and provide great support for all sleeping positions. A multi-function valve allows you to fine-tune the inflation, so you get to perfectly customize the pillow to support you. This lightweight and compact pillow is available in two sizes (14 x 10 x 5 inches or 16.5 x 11.5 x 5.5 inches), depending on your pillow preference and how much room you have while travelling. Pros: Scalloped edge centers pillow around shoulders; comes with a stuff sack. Cons: Makes a little noise when you move; may shift during sleep. What You’ll Like It: Inflatable pillow with a LIFETIME warranty and bonus 100% silk sleeping eye mask. WELLAX sets themselves apart with their ultralight inflatable camping pillow. This pillow offers ergonomic neck and lumbar support and is comfortable for all sleeping positions. The soft and breathable eye mask relaxes your eyes and helps you sleep. Made from durable, water resistant TPU fabric and high-quality nylon, WELLAX’s pillow inflates in seconds to 16 x 12 x 4 inches and folds into a 5 x 2-inch sack. That’s smaller than a pop can! Since it only weights 2.75 oz, it’s ideal for backpackers who need to pack light. Other perks of this pillow are that it’s machine washable, heat-resistant, and the bottom is made with slip-resistant material. You can have it firmly inflated in just 3-5 breaths while the two-way valve prevents air leaks. From there, you can adjust the firmness to your preference. Pros: No risk purchase; u-shaped to fit around the head and neck. Cons: As with all inflatables, there is a risk of air leaks. What You’ll Like It: Plush camping pillow made with shredded memory foam and super soft fleece fabric. If you need a camping pillow and an inflatable one just won’t do it, Compact Technologies’ memory foam travel pillow might be just what you need. This pillow rolls and compacts, with a material flap and drawstrings to keep it secure. When fully expanded this pillow is 17 x 10.5 x 5 inches. It was designed to be extremely comfortable and conforms to the shape of your head to relieve pressure. It also makes a great lumbar pillow for back support. While this pillow is a little larger and not quite as compact as some other camping pillows, they do offer a 100% satisfaction guarantee, so there’s no risk in giving it a try! Pros: Fluffs up nicely; comes with a carabiner to hook it to a backpack or suitcase. What You’ll Like It: A tough, waterproof camping pillow with robust seams and an anti-slip design. The inflatable camping pillow set by ope+ is a great ultralight option for campers and backpackers alike. This ergonomic pillow has a curved shape to provide neck and spine support for all sleep positions. It only takes 3 to 5 breaths to inflate this pillow and it’s even quicker to deflate it. Adjusting the firmness to your personal preference is easy, and it even comes with a hypoallergenic soft cotton cover. It can also double as a lumbar support pillow. This pillow inflates bigger than some others at 17 x 13 x 5 inches and compacts down to 5.5 x 4 x 4 inches. At 5.9 oz, it’s lighter than some but heavier than others. Pros: Comes with a carry bag; 2-year money back guarantee. Most of the time when we camp, we just make do with what’s available, like old pillows from home or pillowcases filled with clothes. So why spend your hard-earned money on a dedicated camping pillow? Because you deserve it! Camping is supposed to be a fun, relaxing activity. You know what’s not relaxing? Waking up with a sore neck/back/shoulders, waking up with your head on the cold hard ground, or getting a crummy night’s sleep in general. A camping pillow is a great investment because the right one will solve ALL these problems and make sure that you get the most out of your camping trip. There are many kinds of camping pillows, so be sure to do your research to select the appropriate one for your needs. Weight: When camping, we don’t want to bring too many heavy things along. Especially if we’re backpacking. This is where weight is important. Self-inflating camping pillows are convenient but tend to weigh more. Inflatable ones are the most lightweight. Size: Another thing we don’t want to bring with us on a camping trip are too many bulky things to carry around. The size of your camping pillow should be based on your preference (would you sleep well on a pillow that’s smaller than usual?) and how much space you have. Shape: Camping pillows come in many different shapes, including ordinary pillow-shaped ones. Many are curved to offer ergonomic support for your head, neck, and shoulders and to help keep the pillow in place while you sleep. Support: When you’re shopping for a camping pillow you want to make sure you won’t be waking up feeling like your head is on the ground. Memory foam camping pillows are great for people who need extra support. Inflatable pillows sometimes have an extra filled layer for support, and air can easily be taken out/added to adjust the firmness. Compressibility: The size of your pillow when you’re sleeping on it is one thing, but what about when you’re on the go again? How small can your camping pillow get; will it fold to fit into a backpack easily, or does it deflate and come with a small sack to stuff it into? Care Instructions: When making an investment into a product like a camping pillow, paying attention to the care instructions is important to ensure that it lasts. Some camping pillows are machine washable, while others must be hand-washed. Comfort: It’s easy to get side-tracked with all the practical features of camping pillows, but will it be comfortable? If it’s inflatable, will it move in your sleep or make a lot of noise? Will it be firm enough to be supportive but also soft and not too hard? Durability: When we’re camping or travelling, we need things that are durable and will last. Pillows are no exception. Look for pillows that were designed to be durable and are waterproof (to withstand the elements). Elastic TPU fabric is a popular durable material for camping pillows. Warranty: If you’re going to put money into a camping pillow you want to make sure that it’s covered by a warranty. This way, if there is a defect (which happens sometimes with inflatable pillows) or it isn’t what you expected, you can get your money back. 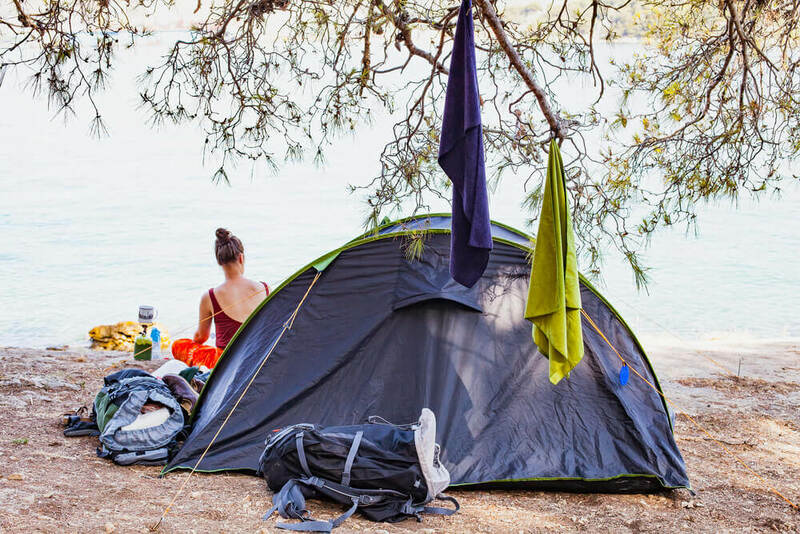 These are just some of the basics that you want to keep in mind when you’re thinking of buying the best pillow for camping. If you choose one blindly without considering your options first, there’s a good chance it won’t be what you’re looking for. For serious campers or travelers, a camping pillow is a must-have. A camping pillow is a great way to make sure that you’re well-rested, so you make the most out of your trip. Knowing that you’ll have a dry, comfortable spot for your head at night is a relief, and the right backpacking pillow takes care of issues like soreness, losing your pillow when you move at night, and lugging around a regular-sized pillow. What is the Best Pillow for Neck Pain and Sore Shoulders?